A woman in Turkey's northern province of Samsun was punished with a record fine of 12,547 Turkish liras ($4,430) for harming other animals through the abuse of her "pit bull terrier" pet, while the dog was seized and placed into a shelter. G.S., 18, posted graphic images of her dog attacking or killing other pets or stray animals through her social media accounts. In one post, she claimed a cat was killed by her pit bull, while three cats and a dog were killed the previous day. The posts sparked public outrage with many social media users reacting against the bloody images, while online campaigns and petitions were launched urging officials to find and punish the woman. Animal rights foundations filed criminal complaints against the woman. Image posted by G.S. 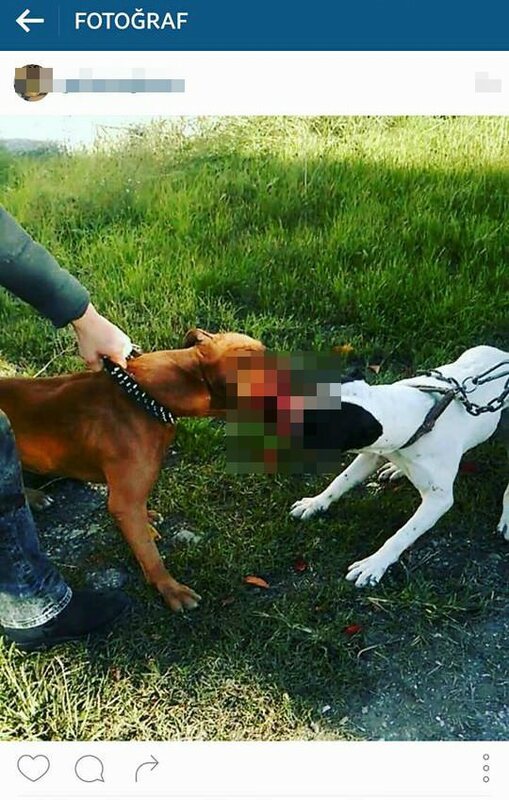 on Instagram shows her dog (R) attacking to another dog. Units from local branch of the Ministry of Forestry and Water Management, along with police units, found G.S. after a brief investigation and seized her pit bull. The dog was placed into the animal shelter of Samsun Metropolitan Municipality, while G.S. was barred from petting an animal ever again due to abuse and maltreatment of the dog. The inquiry of the ministry units also found G.S. guilty for dogfighting and harming stray animals and an administrative fine of TL 12,547 was given. The ministry also filed a criminal complaint to the Samsun public prosecutor's office for G.S. 's actions breaching the Turkish Penal Code and Animal Protection Code. E. Yasin Yılmaz, chairman of countrywide stray animal association SOHAYKO, thanked the ministry and police units for their efforts and said that this case should set an example for everyone in Turkey. Yılmaz urged people to report such abuse and violence cases to local directorates of the ministry. The pit bull breed had been earlier involved in violent attacks on humans and pets throughout Turkey, and latest incident raised question marks about the breed. In an earlier statement regarding the incident, Yılmaz said any dog, depending on how it was bred, can show similar behavior. The owner should be blamed for such attacks, Yılmaz said, and there is no guarantee that the owner would not inflict violence to a children or an adult through the dog.